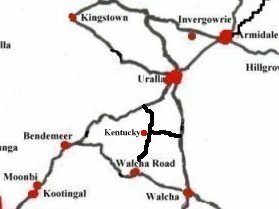 This map shows URALLA and its surrounds. Many of the other places on this map are active links to enable you to go straight to that particular place. For detailed maps in a variety of formats, click the button below and choose which options suit your particular needs. Local councils do have some maps of communities located within their boundaries (as well as other information). You can access this information through the Local Council site through the link found on Local Information Section of this site. This map is drawn to approximate scale. The markings indicating cities, towns, villages and communities within the region are not representative of their true size. The roads are indicated as links between centres and are not to be taken as to represent the type or quality of the road. People wishing to know this information should obtain proper road maps from motoring authorities or other sources. There is also a DETAILED MAP of the region that shows the basic interconnection and location of most of the cities, towns, villages and communities within the region. This DETAILED MAP has active links to the towns across the region. This map is approximately 250Kb in size and so it may take a little time to load.